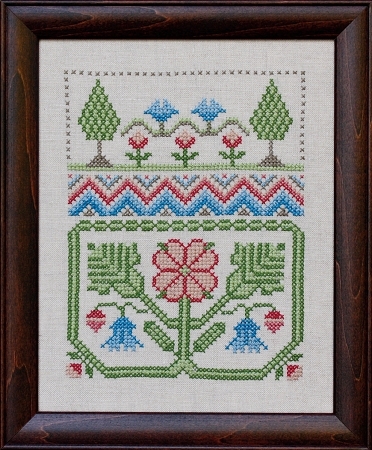 This eye catching antique type cross stitch stamped sampler features a central antique motif divided by a band of flame stitch type stitches and crowned by a tree and flower scene. The sampler has beautiful blending colors. This cross stitch stamped sampler is sewn on natural linen and compliments our # 467, Lessons on Linen. Copyright Country Stitching Inc. All Rights Reserved. eCommerce Software by 3dcart.